Having a Tim Gunn moment and making it WORK!!! 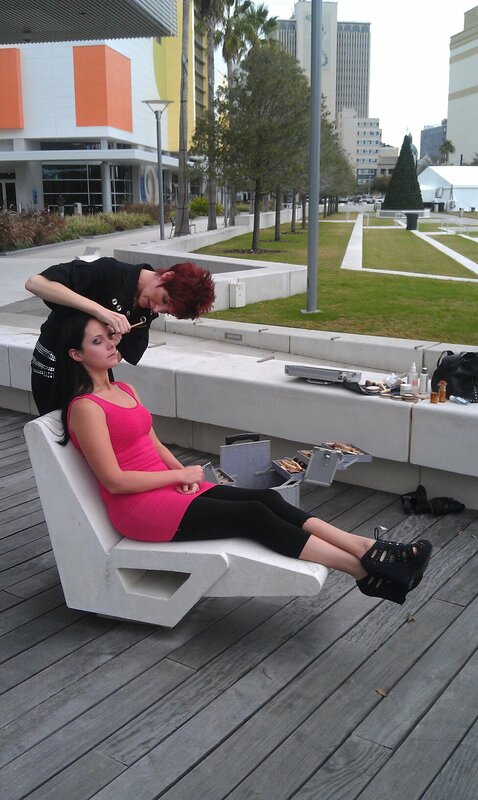 Yesterday I was the makeup artist as a promotional work for a great designer Bobbie Yvonne Kingsbury www.thefashionauthority.com for a photo shoot for Vocess magazine at the Tampa Museum of Art and I just thank the Lord it was a beautiful day in Tampa Bay because I had to do all the makeup outside in a park. Although this may sound strange to a person who lives outside the world of photo shoots, this is normal to us that do. Even though the lighting was perfect everything else proved to be a challenge. The chair was low and awkward and the sun was too bright for the model to look up for eye application. Worse still I had a bug fly right into my mascara wand.Yuck! Being the consummate professional I just acted like it was no big deal because frankly in this world, it isn’t. During my 21 year career (I was the youngest National Makeup Artsit for Chanel at a ripe age of… nevermind) you come across many challenges doing makeup, especially when you’re freelance AND working on site. I remember one July I was working on an infomercial in Tampa, FL and the shoot was in the middle of nowhere on a remote plot of land that my model had just purchased. It was high noon, hot and sticky without a cloud in the sky. Without even the mere sniff of a breeze I set up my mini table and pulled out my big guns, a brand new box of tissues. I immediately knew my model was going to be sweating so I just smiled and said, “You’re doing fine, you just get your lines right and then we can get out of this heat.” By the time it was over the cast and crew were all burnt out, their clothes were soaked and we had given a whole new meaning to the word dehydration. Even though I’m not accustomed to carrying an umbrella when it’s raining I now make sure I have one in my car at all times! And finally here is a tip for any makeup artists and crew members on a shoot, anything and everything can and will happen. It’sall about being flexible and professional at all times, period. Remember to smile and to always think, this is just a part of the world I’m so blessed and happy to be working in. I certainly have otherwise I wouldn’t have lasted this long. Make it work! Well I noticed on your photo that it looks like you were caught in an awkward position but at least you are doing what you love!!!! Absolutely love what I do, awkward or not!